The world of technology (in particular) is moving very fast. I used to surf the web looking for what was new on key sites, but then decided that I would rather have the information come to me rather than me having to stumble across it. I then subscribed to lots of mailing lists, but once RSS feeds arrived this enabled access to even more information in a manner that meant I wasn't drowning my Inbox (or having to set up numerous auto-filter rules), so I stopped subscribing to the vast majority of mailing lists. For the past year I have been using Twitter and RSS feeds as key methods for keeping up with what's going on. I now wonder what next year will bring and how Semantic Web technologies will change relevant information makes its way to me. Technologies such as Twitter have enabled me to keep well informed about what it going on going on in the IT space, and Yammer has been great at finding out what is happening at work to throw ideas around. A lack though of decent Information filtering tools has meant that it is not easy to keep on top of the water hose of information that is available. Semantic Web technologies will become more prevalent in 2009 (probably not mainstream though) and it will be interesting to see how these assist in sourcing information that I want to read from all over the Internet and maybe even summarising it for me. How are other people sifting their way through the large amounts of information out there, and what tools and/or processes do you expect we will be using in the next few years? One technique I've found helpful is to use a devoted email address to catch comments and other notifications and send them to mailbucket to be converted to a rss feed, which is then periodically polled by twitterfeed and pumped into a devoted twitter account which I've subscribed to with my normal twitter account. The end result of all this is I no longer have to subscribe to comment rss feeds (like this one) - replies just find their way to me. I think in the future we'll have more of these 'social agents' to harvest pertinent information and send it our way without having to do as much active trawling. It would give us more personally focused info - there's only so much one can do with the old 'one size fits all' model of relevance in google, something I think they realise judging from the fact that they're talking up more personalised search. Something else I'd like to see is a browser plugin that can run text to speech conversions readily. 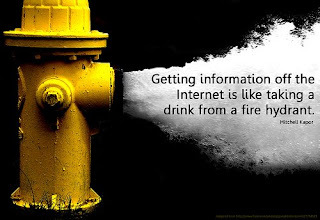 I could fit more of that firehose into my head if I could listen to anything (social agent feed perhaps?) on the fly while buttering my toast, etc. Podcasts are flexible, but not everything I want is in a podcast. Thanks cnawan for the useful mashup information. Lots of good ideas in there to try out. I definitely agree that we'll have more of these "social agents" which build up a complex understanding of what we are interested in by observing our behaviours (what we read, respond to, etc.). They will then use this as basis for finding and filtering information specific to your needs. what rss feeds do you follow? In terms of my current top 3 Blogs for happenings in the Technology world: ReadWriteWeb, Techmeme, O'Reilly Radar. So what is this Twitter you keep going on about?